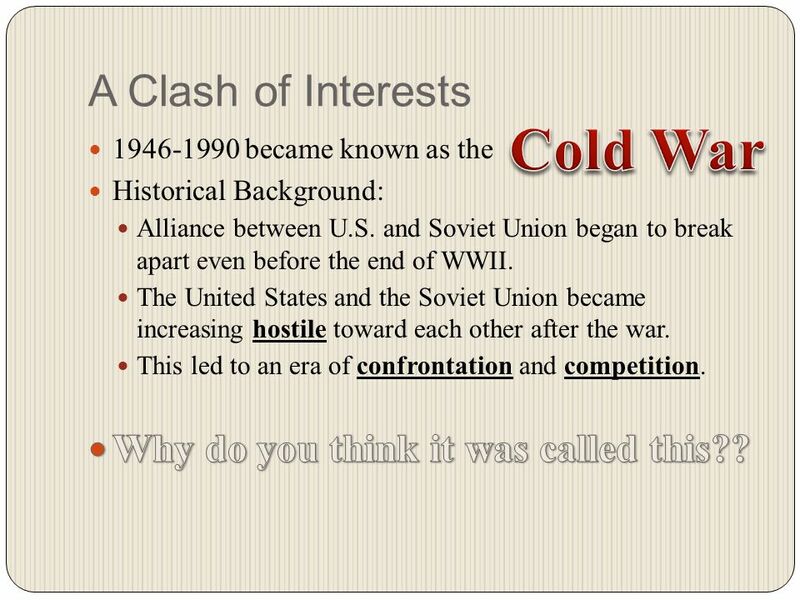 Section 1: Origins of the Cold War The Cold War Begins, 1945-1960. 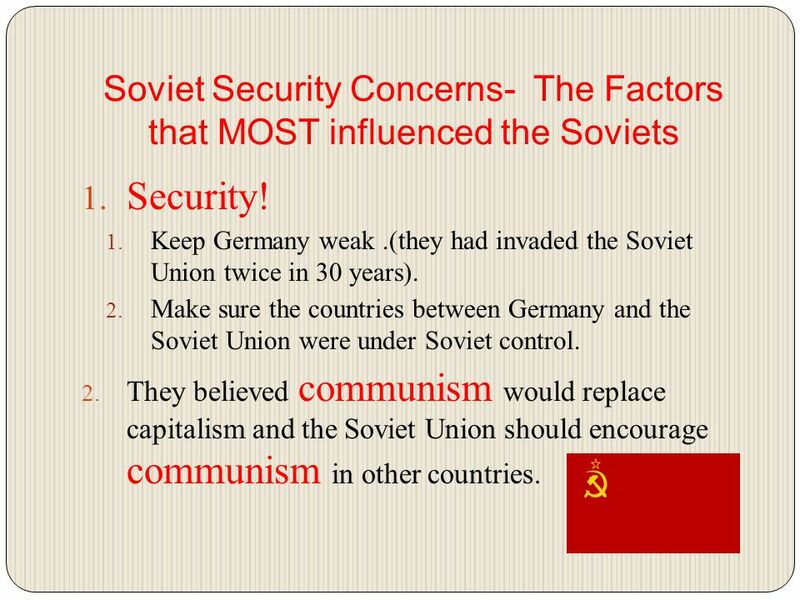 3 Soviet Security Concerns- The Factors that MOST influenced the Soviets 1. Security! 1. Keep Germany weak. (they had invaded the Soviet Union twice in 30 years). 2. 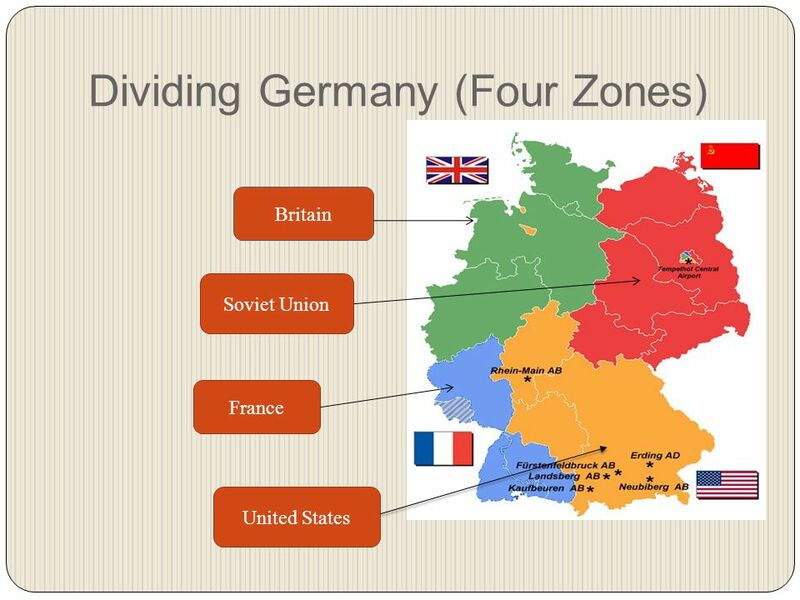 Make sure the countries between Germany and the Soviet Union were under Soviet control. 2. They believed communism would replace capitalism and the Soviet Union should encourage communism in other countries. 4 American Economic Concerns Some Americans believed the Depression had caused the war (Hitler would never have come to power; Japan would not have wanted to expand its empire) Trade Cut-backs Have to go to war to get what you need. 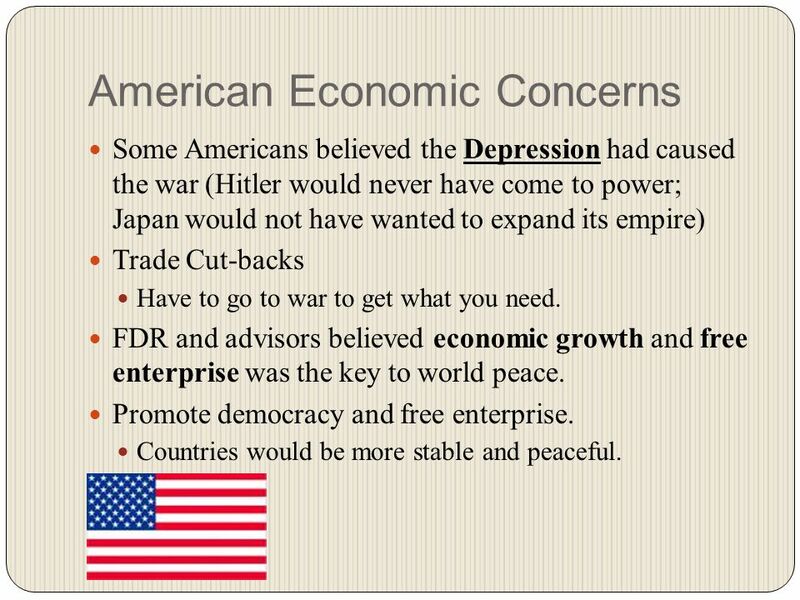 FDR and advisors believed economic growth and free enterprise was the key to world peace. Promote democracy and free enterprise. Countries would be more stable and peaceful. 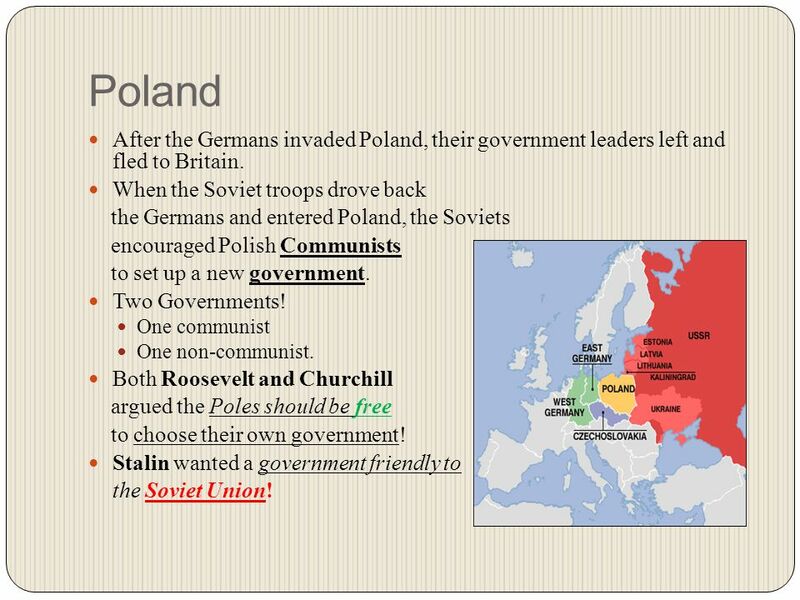 6 Poland After the Germans invaded Poland, their government leaders left and fled to Britain. When the Soviet troops drove back the Germans and entered Poland, the Soviets encouraged Polish Communists to set up a new government. Two Governments! One communist One non-communist. Both Roosevelt and Churchill argued the Poles should be free to choose their own government! Stalin wanted a government friendly to the Soviet Union! 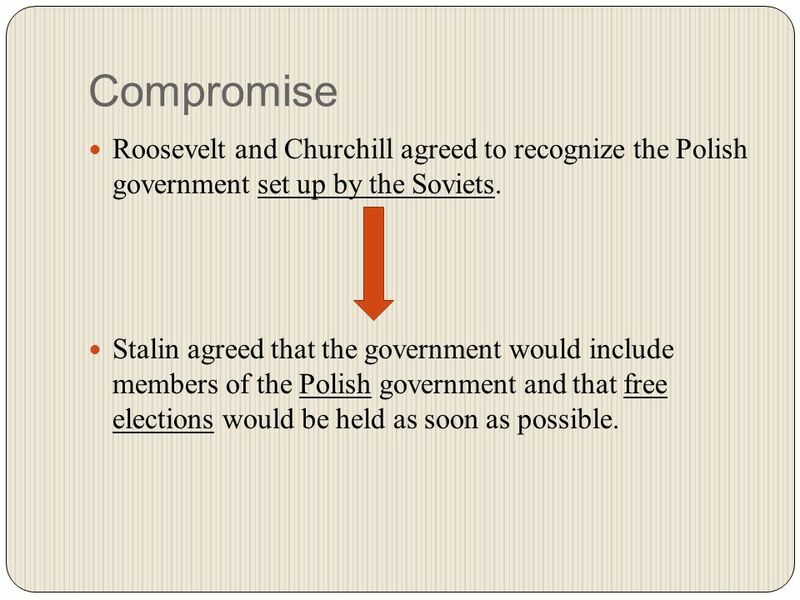 7 Compromise Roosevelt and Churchill agreed to recognize the Polish government set up by the Soviets. Stalin agreed that the government would include members of the Polish government and that free elections would be held as soon as possible. 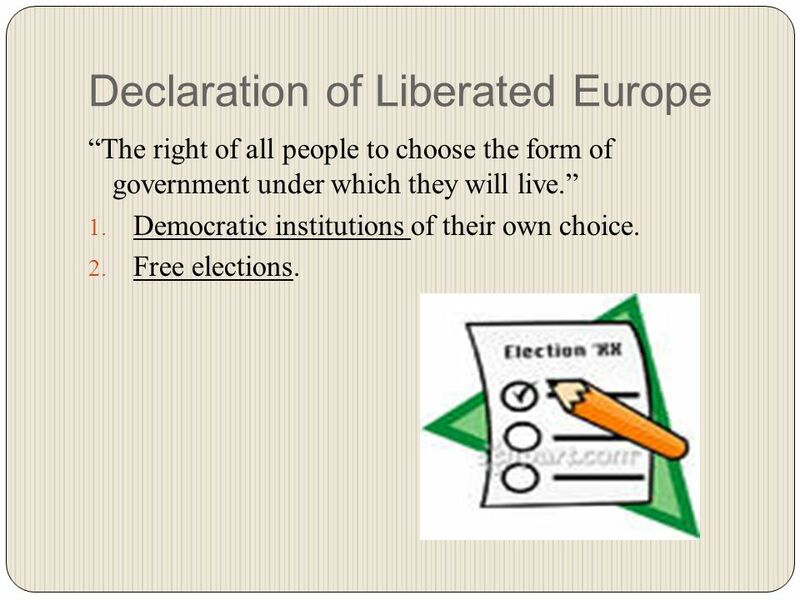 8 Declaration of Liberated Europe “The right of all people to choose the form of government under which they will live.” 1. Democratic institutions of their own choice. 2. Free elections. 11 War Reparations Stalin demanded Germany pay heavy reparations. FDR agreed but he insisted payments be based on Germany’s ability to pay. Both agreed that trade goods and products could be used instead of cash. 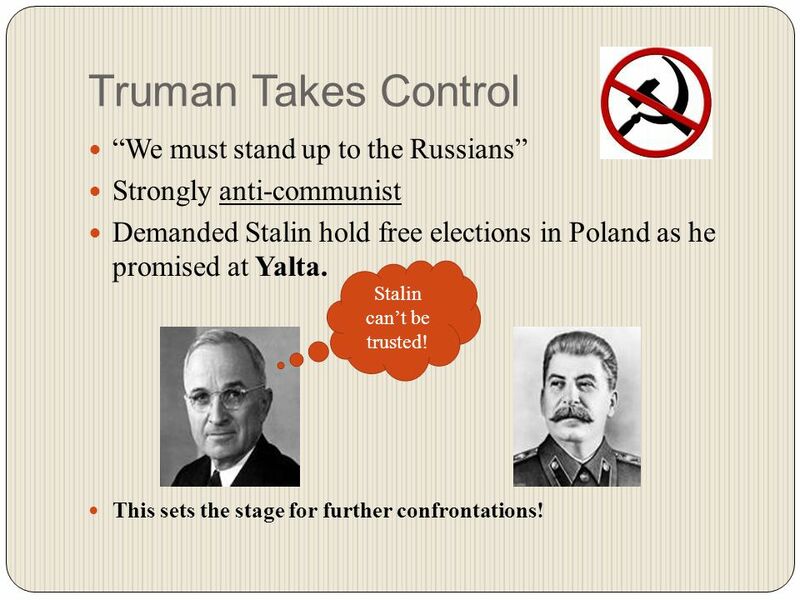 13 Truman Takes Control “We must stand up to the Russians” Strongly anti-communist Demanded Stalin hold free elections in Poland as he promised at Yalta. This sets the stage for further confrontations! Stalin can’t be trusted! 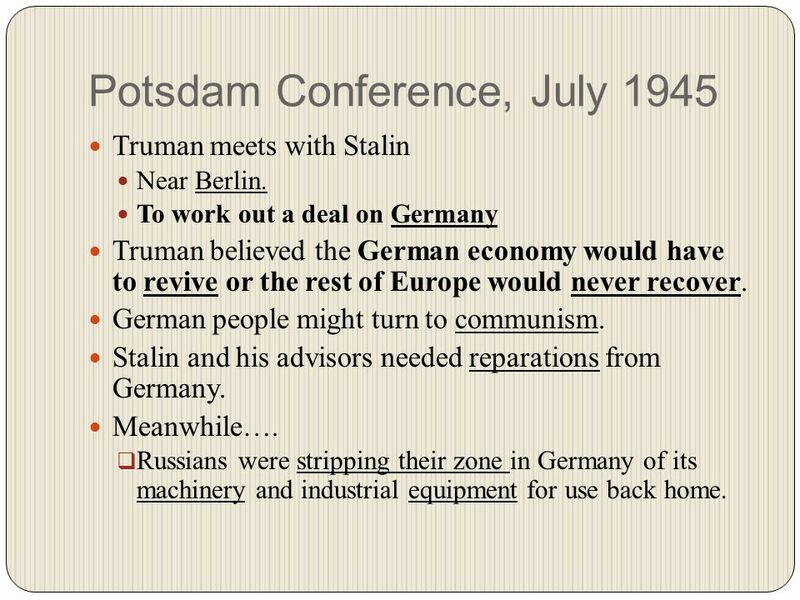 14 Potsdam Conference, July 1945 Truman meets with Stalin Near Berlin. To work out a deal on Germany Truman believed the German economy would have to revive or the rest of Europe would never recover. German people might turn to communism. 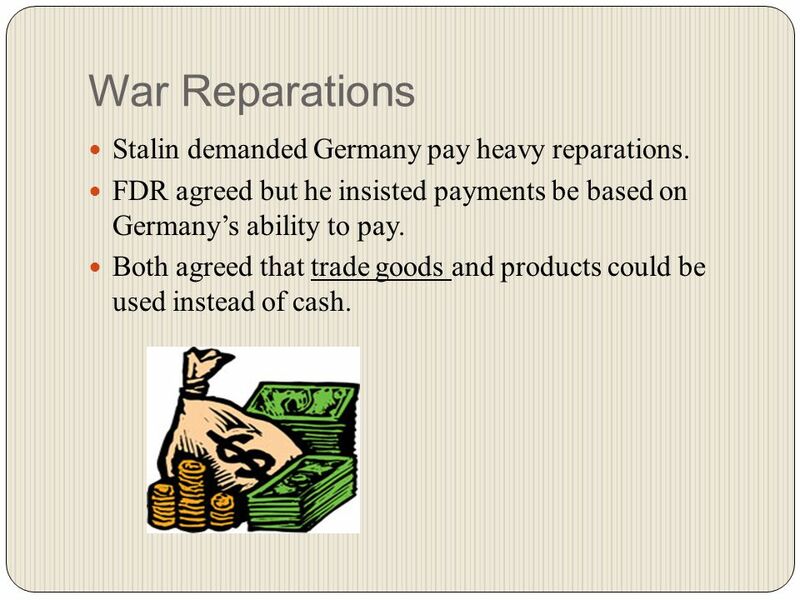 Stalin and his advisors needed reparations from Germany. Meanwhile….  Russians were stripping their zone in Germany of its machinery and industrial equipment for use back home. 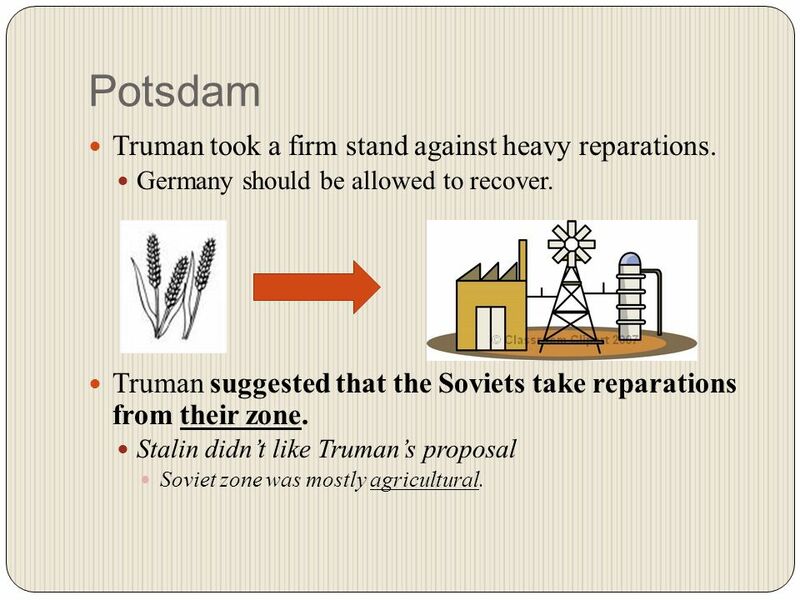 15 Potsdam Truman took a firm stand against heavy reparations. Germany should be allowed to recover. Truman suggested that the Soviets take reparations from their zone. Stalin didn’t like Truman’s proposal Soviet zone was mostly agricultural. 16 Deal or No Deal? 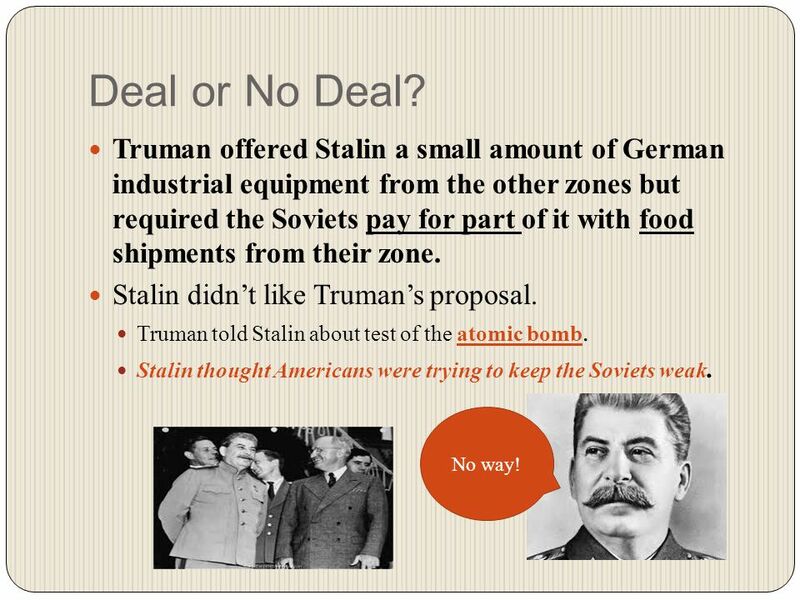 Truman offered Stalin a small amount of German industrial equipment from the other zones but required the Soviets pay for part of it with food shipments from their zone. Stalin didn’t like Truman’s proposal. Truman told Stalin about test of the atomic bomb. Stalin thought Americans were trying to keep the Soviets weak. No way! 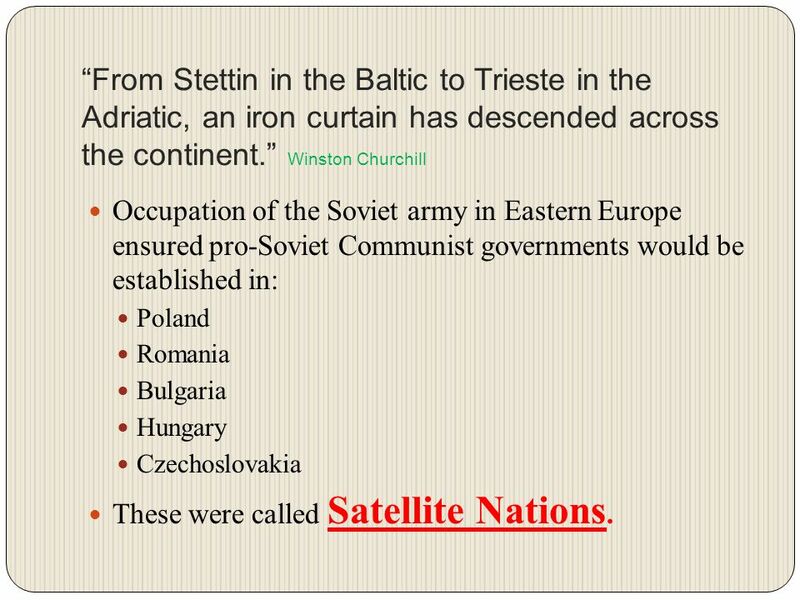 17 “From Stettin in the Baltic to Trieste in the Adriatic, an iron curtain has descended across the continent.” Winston Churchill Occupation of the Soviet army in Eastern Europe ensured pro-Soviet Communist governments would be established in: Poland Romania Bulgaria Hungary Czechoslovakia These were called Satellite Nations. 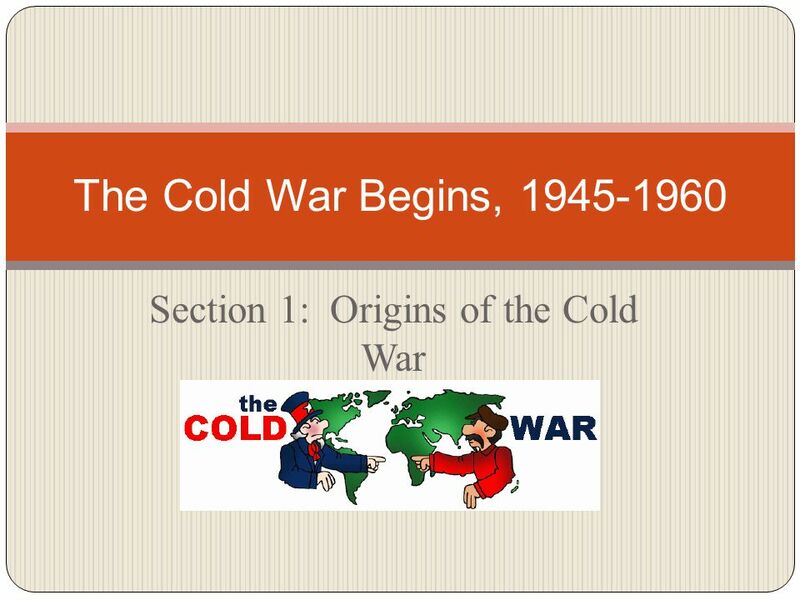 Download ppt "Section 1: Origins of the Cold War The Cold War Begins, 1945-1960." 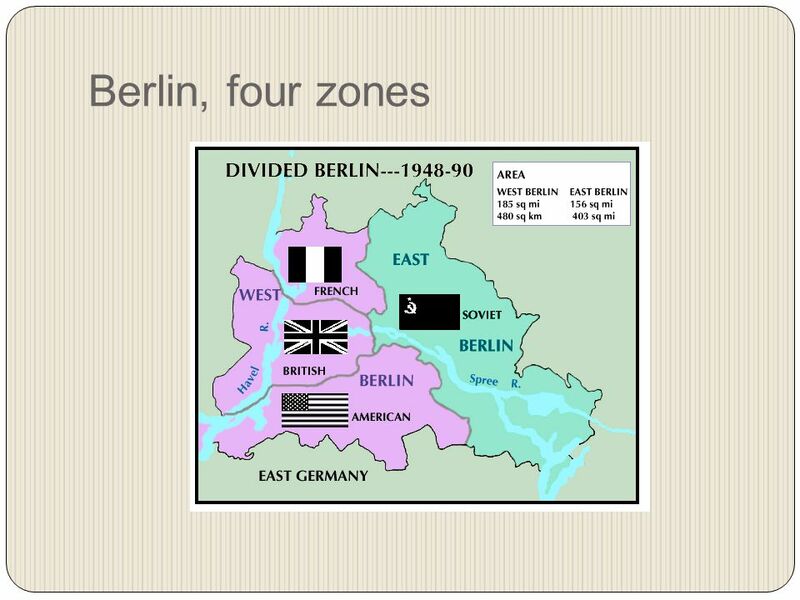 Chapter 26 Section 1 The U.S. and the U.S.S.R were allies but Different political systems (see the next two slides). Stalin signed the Non-Aggression. 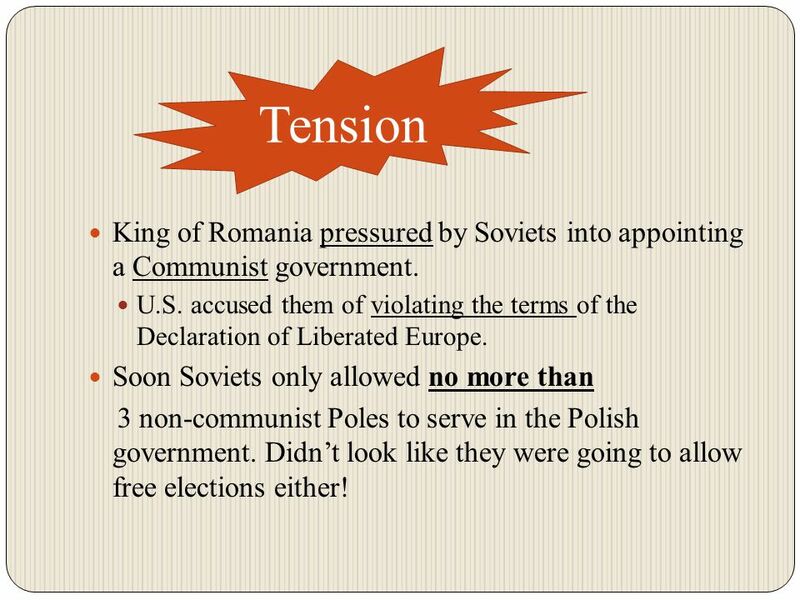 Essential Question Why did tensions between the U.S. and U.S.S.R. escalate after World War II? The End of World War II Conferences and Cold War. Origins of the Cold War CHAPTER 26 SECTION 1.  Wilson sent U.S. troops to help anti- communists in 1917  Did not politically recognize Soviet Union. 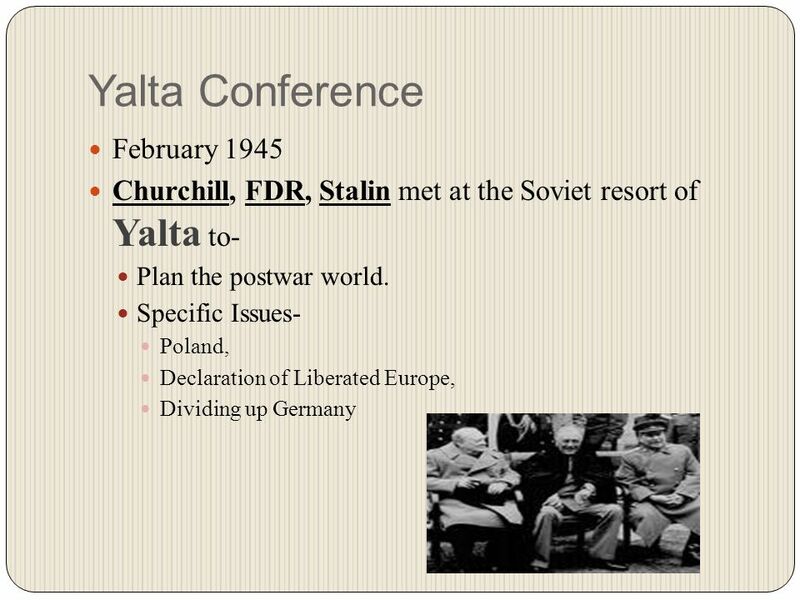 Yalta Conference CRIMEA CONFERENCE, UKRAINE February 1945. GCSE MODERN WORLD HISTORY INTERNATIONAL RELATIONS ORIGINS OF THE COLD WAR INTERACTIVE WHO WAS TO BLAME FOR STARTING THE COLD WAR? Chapter 26 Section 1 Origins of the Cold War A Critical Year Differences at Yalta Stalin, Roosevelt and Churchill were the people at Yalta –Germany. Getting to California Cold War ( ) Confrontation and competition between the US and USSR with actual fighting taking place between nations that. The Origins of the Cold War Chapter 22 Section 1.